It’s the film franchise that's no threat to self-destruct. 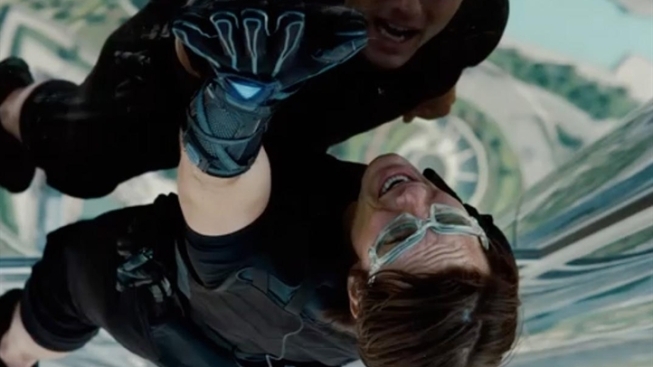 As the latest filmmaker to put Tom Cruise’s secret agent Ethan Hunt through a new roster of nail-biting assignments in “Mission: Impossible – Ghost Protocol,” director Brad Bird not only bolstered the long-running small-screen-to-cinema property, he also proved that he’s as adept at crafting live-action thrills as he was in such Pixar insta-classics as “The Incredibles” and “Ratatouille.” Just in time for “M:I4” to explode onto home video April 17, PopcornBiz debriefs Bird on a shoot that sounds as down-to-the-wire as one of those impossible missions. If you’re a subscriber to the auteur theory, can you see some connective visual or storytelling elements between 'M:I4' and your other films, whether live action or animated? I am probably the worst person to ask about it, because I don't stand outside of my style. I don't look at something and go, 'Oh, this will be a good example of my touch.' I just kind of go, 'Whoa, this would be cool,' and then whatever it is that I think is cool, if there's any common elements then that becomes my style, quote-unquote. So I think that others probably are better to judge what the common elements are, but a lot of people have remarked that the movie does feel like my other films in a lot of ways. Because of the size and scope of this film and the speed in which you had to shoot it, I’ve gotten the impression that you had to go with the flow a lot and trust your creative instincts on the spot rather than elaborately pre-plan as you’ve done in animation. Was that an easy jump to make? Jeremy Renner, Paula Patton and Simon Pegg chat about getting the call to take part in "Mission: Impossible - Ghost Protocol." Also, what do they think of co-star Tom Cruise's wild stunts in the movie? Well, it turned out to be all right. It was scary because I'm used to kind of planning things a little more, and I got to plan three sequences in the movie. I got to do pre-visualization on three sequences in the movie: the tower climb, the car park thing and then I did about half of the sandstorm chase in pre-viz so that I knew how I wanted it done before we got to shoot it. But the rest of the movie, there were a lot of other very complex sequences that I didn't have that luxury of pre-planning on, like the prison escape and the fight with the two girls and the Indian party sequence – all of that stuff where we kind of had to do it on the fly. I think the fact that I came from animation and I have boarded things myself and I'm used to pre-planning actually was liberating, because I could imagine how something it was going to cut together on the fly. I didn't know whether it was going to work out or not, but there wasn't time for anything else. Literally I was coming back to my apartment at 11-something at night and I had to be up at 5:30, and when you're wound up it's also hard to go to sleep. You don't want to become a slave to something like sleeping pills because that catches up with you after a while. So, all I'm saying is that very quickly they kept saying, 'You have to have a shot list,' and pretty quickly I came back to them and I went, 'When am I going to do this shot list?' I just said, 'Look, I've got sleep and I've got a shot list. Which one do you think that I can do without?' They realized, 'Okay, that's the way.' So I just had my first shot ready in the morning when I arrived. I had a shot for them to work on and while they were working on that shot I could start to line up the others. I knew how many set-ups I could get in a day, but I was happy when we got to the editing room after it was all over. I didn't even have time to look at the rushes. So I was working with a great cinematographer, Robert Elswit, and I had a great editor and everything like that, but it wasn't until I got back and could really review the footage [to see] that the stuff pretty much cut together like I had hoped it would. That was a real relief. Talk about working with a) Tom Cruise, the producer, b) Tom Cruise, the actor and c) Tom Cruise, the guy who’s itching to do any stunt that you will let him do. He's very much the same guy, in that he has two settings and those are off and a hundred and fifty percent. There is no 80% or 25% percent. He's either all in or he's not in, so when you want to do something he's absolutely 400% there and ready to go and does his homework and knows what he's doing. It's a real pleasure – and it's a challenge because you have to be on your game. You can't be anything less than completely ready because he's completely ready, but I love working with people like that. That's how I like to work, so to work with someone that not only has the amazing amount of knowledge that he does, but he's also delighted to make films – he's not just doing it, he loves it. He loves silent films and foreign films and new films and old films. He is like talking to a dolphin about, like, 'Do you like being in the ocean?' He loves that world and that medium. It's infectious. What's your thinking now, given the creative and commercial success of your first foray into live action, as to how you'll balance things now between that and animation? Do you have ideas of how you want to proceed? I have things that I want to do. It's whether or not I can get other people interested in doing them. That's always up for grabs. I think there's less resistance to things now than there's ever been which is really nice, but I think I don't have any disciplined plan about doing one animation film and then you do three live action films and then another animation film. I'm literally excited by certain ideas and some of them are ideas I see as being animated film and some of them I see as being live action films. It's just a matter of what idea you're most excited about that that other people will finance. I don't take anything for granted. I'm just happy to be working in the medium that I love. I don't have any giant master plan. I just have a bunch of ideas that I'd love to do. What was the biggest creative/professional lesson that you learned coming out of 'Mission: Impossible 4'? I think the biggest challenge was stamina, because there's a lot of pressure and you have to kind of power through it, but I think in terms of a working method it was allowing options later on. I came from animation with a very…I mean, even in animation I'm known as kind of a pre-planner to end all pre-planners. My storyboards are much more accurate to the finished film than most people's are. Most people change things more as they go on, and I work longer on the storyboards to get it close to how I would like to see it in the film and then it goes a little quicker to film, which is not the way that people usually do it. I was trained in the Disney method, where you usually kind of use storyboards as a way to get ideas represented rather than getting particular about how they're staged, but that's not how I think so I tend to get in to the staging early on. I think that it was kind of being a little looser about that and allowing for spontaneity on the floor, which I do in animation in the vocal tracks, but to see it extend to even camera work and stuff like that where you have to be alive to things that are happening right there, that was a good lesson. By the end of the film I think I was approaching things differently than I was at the beginning of the film. Do you imagine that your films will always have a degree of high visual spectacle, or do you have a small, maybe more performance- and dialog-driven piece in mind? Do you want your filmography to get that diverse? I enjoy dialog. I've written the other films that I've made. I have some writing in 'Mission,' but I didn't write 'Mission,’ so I love dialog as much as the next guy. I tend to gravitate towards things that are more visual. I love a lot of different kinds of filmmakers. Usually, if you look on my shelf, the things that I actually buy, the films that I like to see more than once, they're not the kind of actors sitting around and talking movies as much. I like those movies and I see those movies, but I don't re-watch those movies. The movies that I re-watch are firing on all cylinders to me. They're not only good actor films, but they're good cinematographer films and they're good set design films and they have good sound design. I really love that film is a visual medium and I tend to gravitate towards that. But I would never say no to an idea that was a smaller, more personal thing, that was just a really good character piece. I would love to think that I could see the value in that. It's just not what I'm gravitating to right now. I tend to like big experiences.